Satish Jarkiholi, former Minister and senior Congress leader, inaugurated a public awareness programme against blind belief here on Friday. Amidst heavy rain, Manava Bandhutva Vedike members served breakfast and tea to participants at a public burial ground in Sadashiv Nagar. 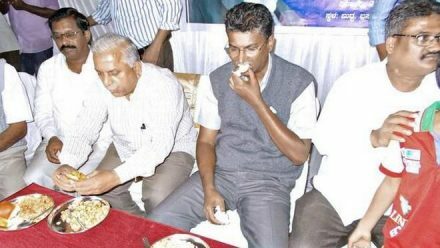 Mr. Jarkiholi had breakfast with rationalists and Vedike members at a rain shelter inside the burial ground. He urged people to “come out of mental slavery that had reduced their capacity for rational thinking”. “This is what Dr. B.R. Ambedkar told us about and we have to follow his ideals. We have been systematically brainwashed to believe unscientific things about eclipses. The astrologers say we should not eat before and during eclipses and throw away drinking water. All this is false. It is sad that our lives are being governed by an almanac that costs just Rs. 10,” he said. He expressed concern that even some governments were following such beliefs and vowed to continue such programmes in the future. “Some people are saying that my winning margin in the recent Assembly election from Yamakanamaradi was reduced as I had filed nominations during Rahu Kala. It is not true. The margin was smaller than last year as I never campaigned. My opponents sent all their family members to villages to campaign for them. But I did not do that. I asked the voters to elect me if they had liked my work as MLA for the last 10 years. I also did not spend much money on my campaign,” he said. “I know how to get a large number of votes. I will use that skill in the next election and show our strength,” he said. Rationalist B.S. Nadakarni Belagavi Mayor Basappa chikkaladinni and others were present. The vedike, founded by Mr. Jarkiholi, has been organizing anti-blind belief programmes annually for seven years now. It has also organized breakfast and mass lunches during eclipses and distribution of milk to destitute and physically challenged children on Nagara Panchami, when milk is offered to snakes as a tradition.